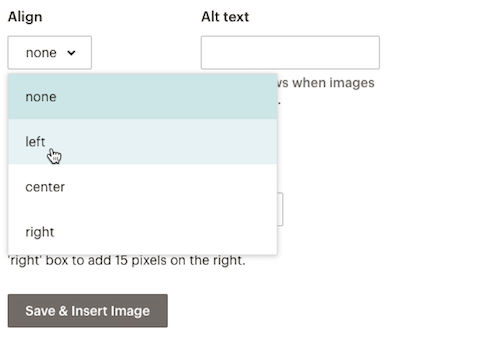 In Mailchimp's editor, you can wrap text around an image to save space and enhance your design. To wrap text around an image, you'll insert the image in a text content block, and choose its alignment. In this article, you'll learn how to wrap text around an image. To ensure your campaign displays as expected, use small images with a width of 100-300px. In drag-and-drop templates, you can only wrap text around an image in Text, Boxed Text, or Footer content blocks. In custom HTML templates, an image can wrapped in any content block that includes an image and text. Be sure to preview and test your email campaign after you wrap text around an image. Some email clients, like Outlook, handle text wrapping differently than other email clients. To insert an image in a text block and wrap text around it, follow these steps. On the Design step, click an existing content block or drag and drop a new one into your layout. In the editing pane, click the area in your text where you want to place the image. Click the Content Manager icon in the toolbar to choose an image. To use a previously uploaded image, click the image and click Insert. To use a file from your computer, click Upload, find the file you want, and click Open. To use an image that's saved online, click the drop-down menu next to Upload, and choose Import from URL. Input the URL, and click Import. On the Edit Image screen, click show image style options. Click the Align drop-down menu and choose whether to place your image to the left or right, or in the center of your text. 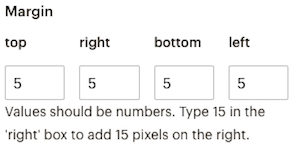 Enter a number in the Margin fields to add space between your image and the wrapped text. Click Save & Insert Image. If you need to make additional changes to the image settings or margins, double-click the image in the editing pane. Learn how to use Mailchimp's Boxed Text content blocks to add text, links, wrapped images, and change the style and settings for them.